Hop on over to Amazon where you can snag this Coleman S’Mores Scented Citronella Candle for just $2.94 (regularly $8.99). This citronella candle has a crackling wooden wick and burns for up to 25 hours. Keep your drinks cold with this Hydro Flask deal! 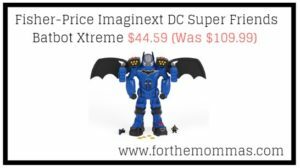 The post Amazon: Fisher-Price Imaginext DC Super Friends Batbot Xtreme $44.59 (Was $109.99) appeared first on FTM. Hop on over to Amazon and snag a Pack of 40 Cheetos Crunchy Cheese Flavored 1oz Snack Bags for only $10.48 shipped when you clip the 25% off coupon and opt to Subscribe & Save. That’s just 26¢ per bag shipped right to your door! Toss these into lunch boxes or keep them in the pantry for a quick after-school snack! Final cost $10.48 shipped – just 26¢ per bag! Today, September 7th only, hop on over to Amazon and snag this Blendtec Total Blender Classic with FourSide Jar for only $179.95 shipped. Turn your home into a smart home with this handy gadget! Today, September 7th only, head on over to Amazon and snag a Certified Refurbished Echo Plus with Built-In Hub in black, white or silver for only $87.99 shipped (regularly $129.99). These refurbished Echos are tested and certified to look and work like new and come with a one-year limited warranty. The Echo Plus connects to Alexa and allows you to play music, make calls, set timers and alarms, ask questions, check traffic and weather and control your smart home devices! And with seven microphones and noise cancellation technology, Echo can hear you from any direction—even while music is playing! Prefer an Echo Show? Grab one for a great price! The post AmazonBasics Microfiber Cleaning Cloth – 24-Pack Cheap appeared first on Yes We Coupon. Hop on over to Amazon where you can snag this Smokey and the Bandit 40th Anniversary Blu-ray + DVD + Digital HD combo for just $8.93 (regularly $14.98) – lowest price! It includes two discs, a digital copy of the movie, and extras like a CB tutorial, making of the movie, and more. Bandit (Reynolds), a fun-loving, fast-talking trucker, takes on his craziest haul yet – delivering 400 cases of beer from Texarkana to Atlanta in just 28 hours. With Sheriff Buford T. Justice (Gleason) hot on his trail and eager to teach him some respect for the law, the Bandit joins forces with good ol’ boy, Cledus (Reed) and runaway bride Carrie (Field). Gear up for huge laughs, pedal-to-the-metal action, and some of the wildest car crashes ever filmed! The Complete Oz audiobook is under a buck! Amazon: Oral-B Avengers Toothbrush Twin Pack Just $2.69 (Regularly $7) – Best Price!